Crafted in direct response to Venetian Society members’ expressed desires, Silversea’s World Cruise 2014 will encompass 54 ports of call in 29 countries, with 12 overnight stays and late-night departures. Silversea celebrates its 20th anniversary in 2014, and we’re launching the festivities with this far-reaching and stimulating exploration of the world onboard Silver Whisper. 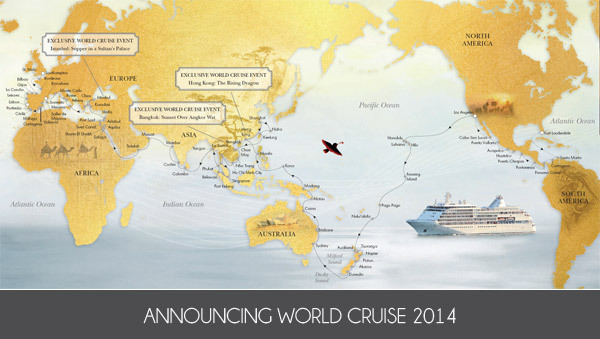 See HERE for the full 2014 World Cruise itinerary, with fares from £34,950 per person. World Cruise 2014 includes more outstanding amenities than ever before with three amazing shoreside events and the most luxurious array of benefits. Gala Bon Voyage reception, dinner and overnight accommodation the evening of 5 January at a Luxury Beverly Hills Hotel. Complimentary Silver Shore Baggage Valet between home and ship in Los Angeles and Barcelona.